When it comes to your pantry, it always seems like there’s not enough space. Pastas collide with pretzels and cans compete for shelf space with jars. Luckily, you can easily create space by throwing out the box your tea bags came in. Take out individual tea bags and then organize them by type of tea, caffeine level, shape, or even alphabetically. 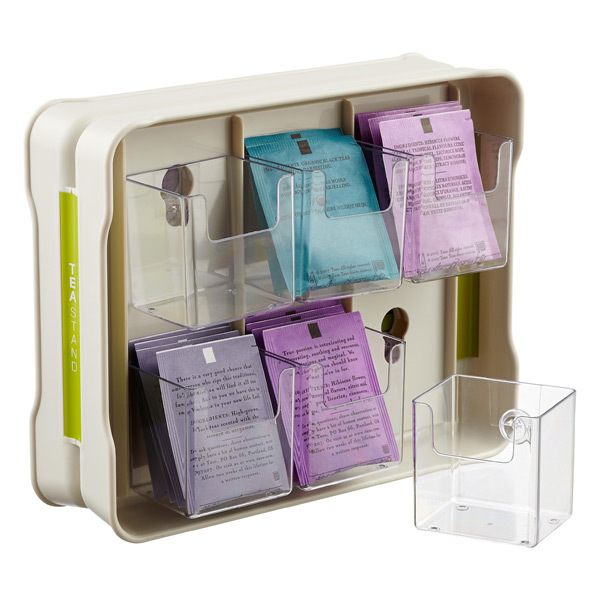 There are many rectangular tea organizers on the market. They’re a good choice if you need things in your pantry to stack well, or you want your tea to fit into a corner. 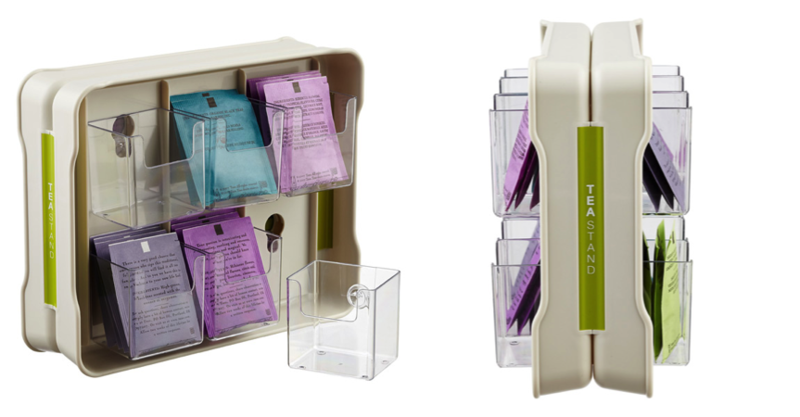 The YouCopia TeaStand from the Container Store can hold up to 100 individual tea bags in its 12 removable, dishwasher-safe bins. It’s a skinny product, so it won’t take up too much pantry real estate, and the design makes it easy to see all your choices. 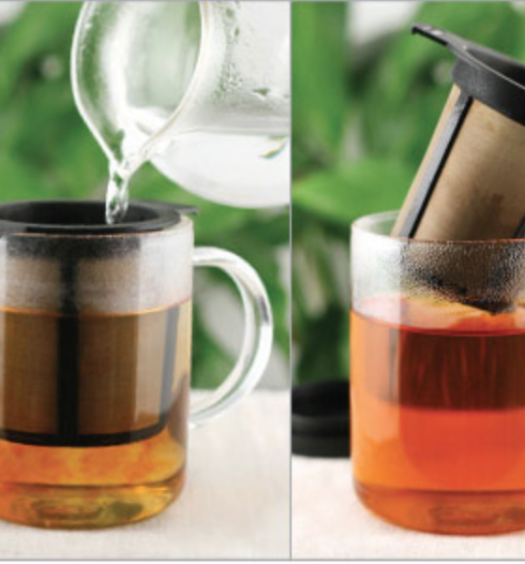 Other options include the Lipper Bamboo & Acrylic 5-Section Tea Box sold at Target (right) and the Mind Reader Royce Wood Tea Bag And Accessories Holder (left), also sold at Target. To make your own organizer, repurpose a tupperware container or small cardboard box and line with tea bags as desired. 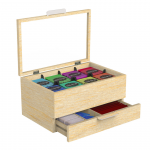 Above is the Rosti 8-inch round tea box, which can hold 60 tea bags in its 6 compartments. For an easy DIY option, repurpose a vegetable tray and do the same thing. 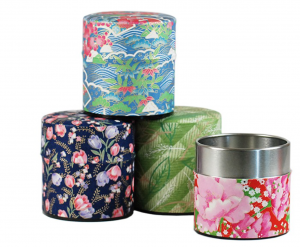 Or, opt for a beautiful circular container like the Washi Sashi Tea Storage Tin from the Art of Tea (right), wrapped in washi, traditional hand-made Japanese paper. For an ultimate space saver, store your teabags in a repurposed hanging jewelry organizer and hang it inside your pantry door, like Pinterest user Paula Monnat did. Wrote Monnat, “I used a hanging jewelry organizer as a cute, inexpensive and space saving way to organize my tea bags. The small pockets are the perfect size for standard individually wrapped tea bags. The large pockets at the bottom hold plastic baggies with the unwrapped tea bags. Best of all, it is double sided! I filled one side with my herbal teas, and the other with my black and green teas. 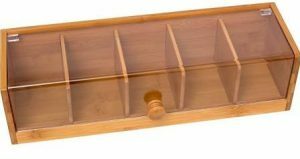 It hangs from a hook on the inside of my pantry door.” Consider this jewelry organizer from Bed, Bath, & Beyond or this one from JOANN. 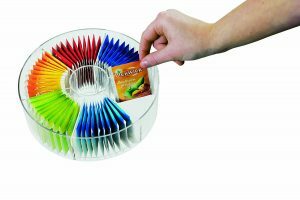 Extreme tea buffs need a way to organize all the processes they prefer for brewing different types of tea. Luckily, we live in the golden age of technology, with a myriad of online tools that can sort all the information in your brain into neat rows and columns. 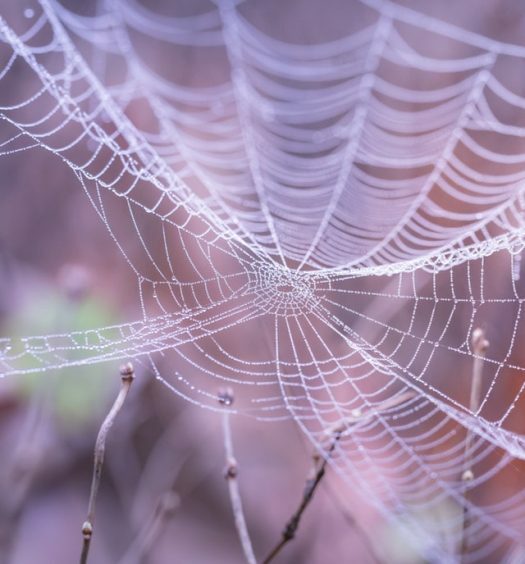 Of course, there’s a reason Google Docs are so ubiquitous: they’re simple and easy to access anywhere with an internet connection. 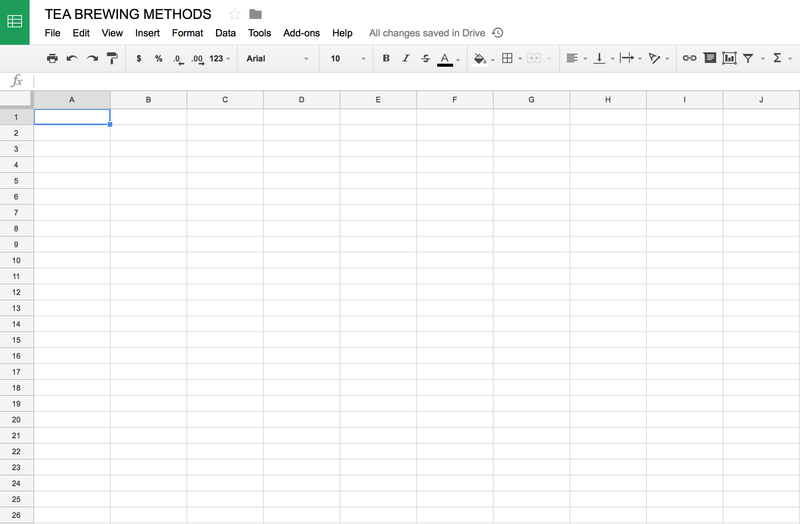 If you’re not a tech maestro, use a google spreadsheet to plainly organize your favorite teas’ brewing methods. Smartsheet provides grids that look like standard spreadsheets, but they’re capable of so much more. From compressing and expanding to including images and video, Smartsheet adds brainpower to any spreadsheet. 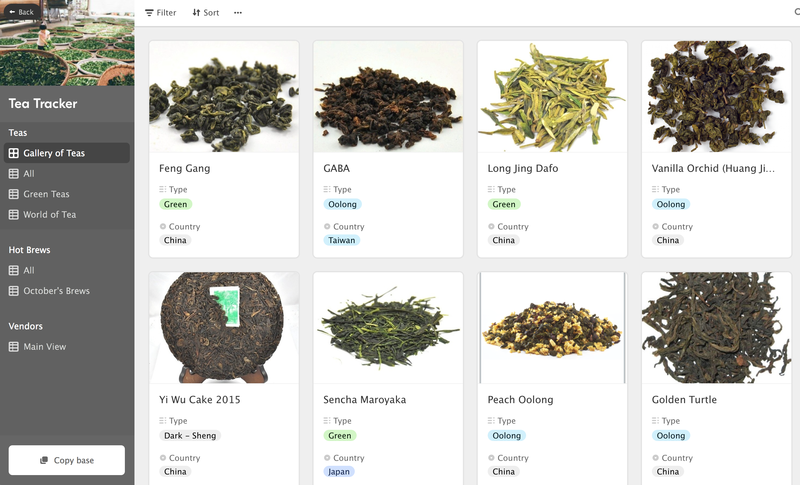 Use the service to organize your tea brewing research and preferences.